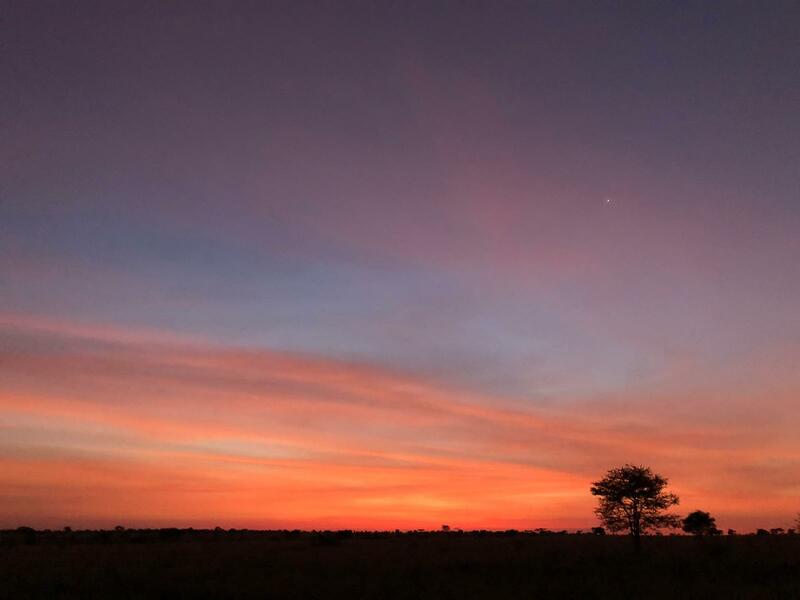 We had decided the night before that we would leave before sunrise on our game drive and have the camp pack us both breakfast and lunch so that we wouldn’t have to return until late in the day and quite possibly after sunset. Thankfully, though, and more so for the others than for me, we were able to make some coffee or tea and drink it down before we left. Having been a coffee addict my entire life, I certainly understood the need for this morning cup of Joe, but over the last couple of years, I have broken myself of that habit and no longer require that morning “fix.” I will have to admit, though, that Adys’ mixture of AfraCafe (Tanzania’s wonderful version of instant coffee that tastes amazing) and Cadbury powdered chocolate was particularly appealing and really hit the spot on our way out. 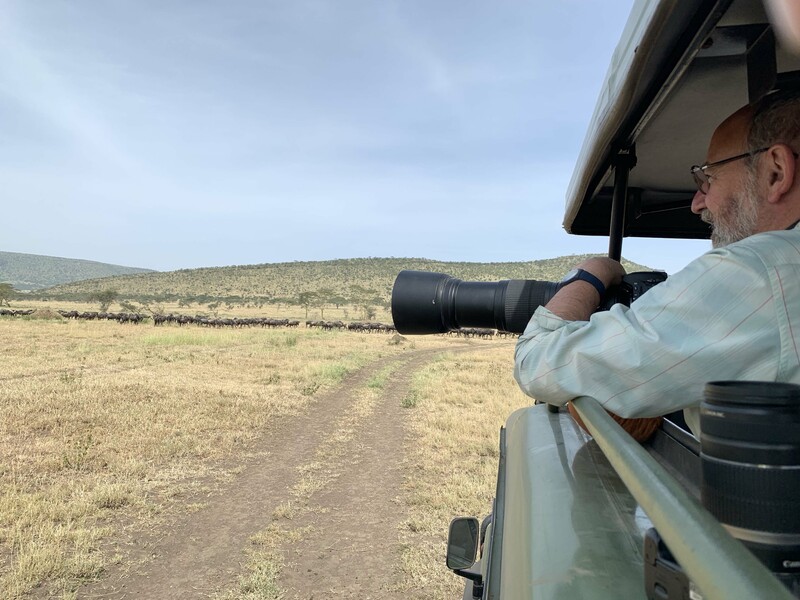 We all readied our camera equipment, Dan and I each with our large “safari lenses” on our Nikon cameras that bring the action tremendously closer. On earlier safaris (game drives) during this trip, I was obviously not taking photos as I was driving so handed my camera off to others to use and have the same experience that I have had over the years. 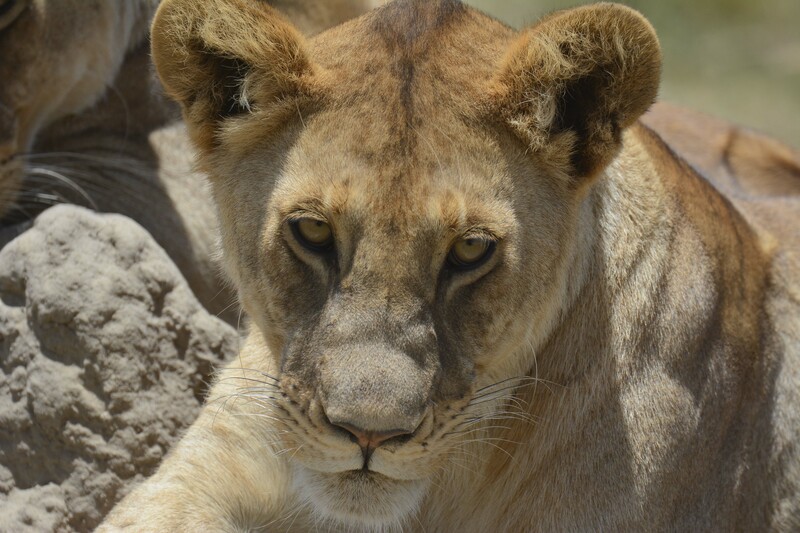 It really is amazing what a long lens does for wildlife photography and especially in a place such as the Serengeti or Africa in general. 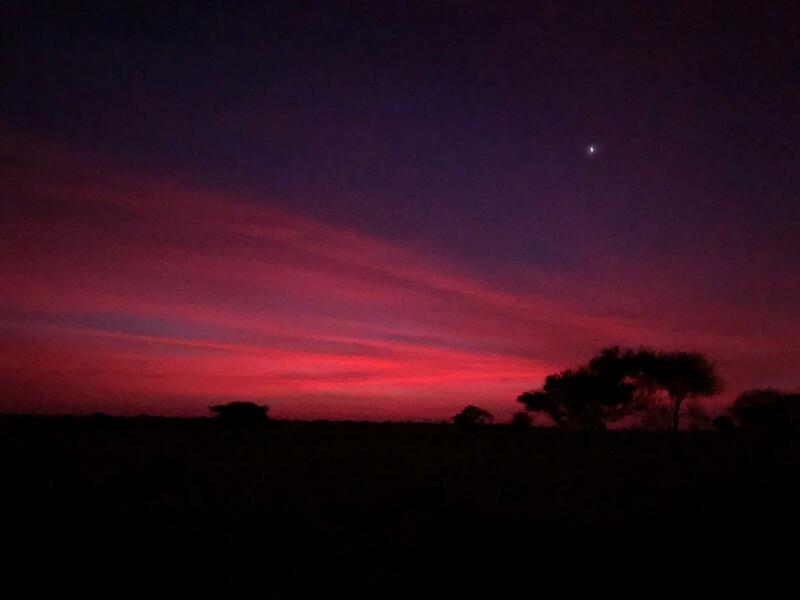 With the top up and standing in the cool air of pre-dawn it can become quite chilly at times and reminds you of just home much radiant energy the sun pours down on us here on the equator. I always advise bringing a light fleece to wear on these trips for the early morning and after sunset as it can become quite cool. 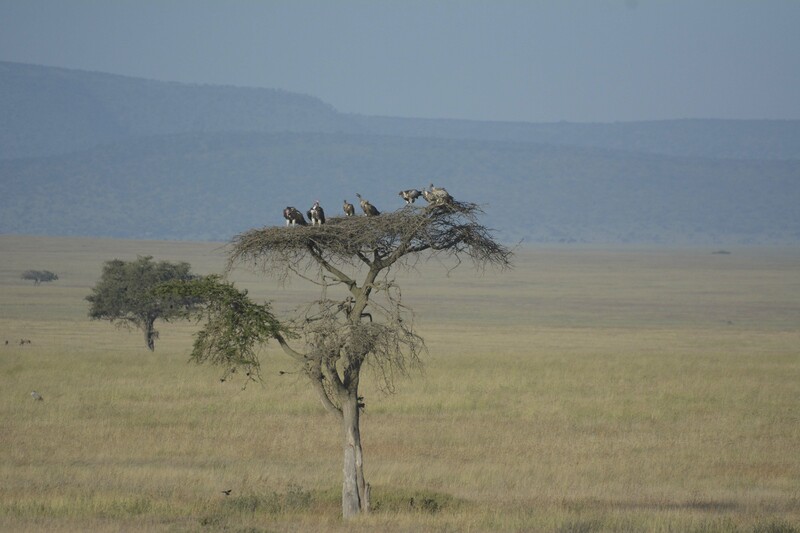 The altitude of the Crater rim is 8000 feet, making for very chilly nights requiring lots of layers, while here on the Serengeti plains we’re probably at 4000 feet, which is still nothing to sneeze at. Our drive took us in the direction of the Maasai Kopjes this morning and right by the launch site for one of the balloon companies who a good friend of mine pilots. We watched the balloon inflating and not yet airborne prompting a number of comments from the group regarding some type of dysfunction for which a certain medication could help, but alas it turned out that Jones (my friend and balloon pilot) had been delaying take off due to high winds at the launch site that were over the limit of safe flight. The balloon eventually launched with tremendous relief by all and we watched as it floated slowly away. Danielle Becker and I flew with Jones several years ago after he invited us to come and I will have to say that it was one of the more amazing experiences that I’ve ever had. 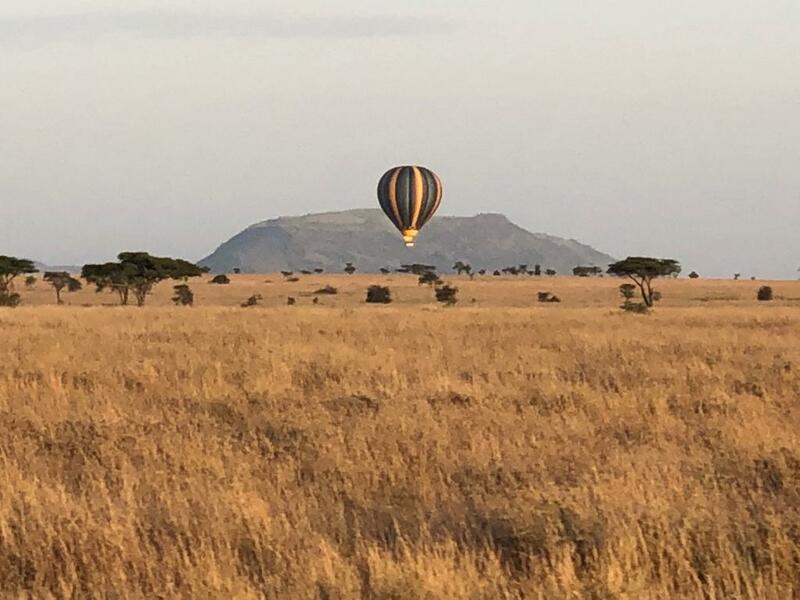 Though I’ve never been in a balloon before , there was certainly something about floating effortlessly above the vast Serengeti plains in all of their splendor at sunrise, the animals moving about below you and universe above, the complete silence broken only by the occasional sound of a blast of hot air into the balloon to keep you aloft. We finished our flight with a champagne breakfast on tables set on the open grass and freshly made while we toasted the pilots of the two balloons that had flown in what we were told was a ballooning tradition. Whether that was true or not was of little consequence considering what we had just experienced. We had gone as guests on the flight, but if I were ever considering the experience again and asked by someone whether I would recommend it to them, I would answer with a strong affirmative. 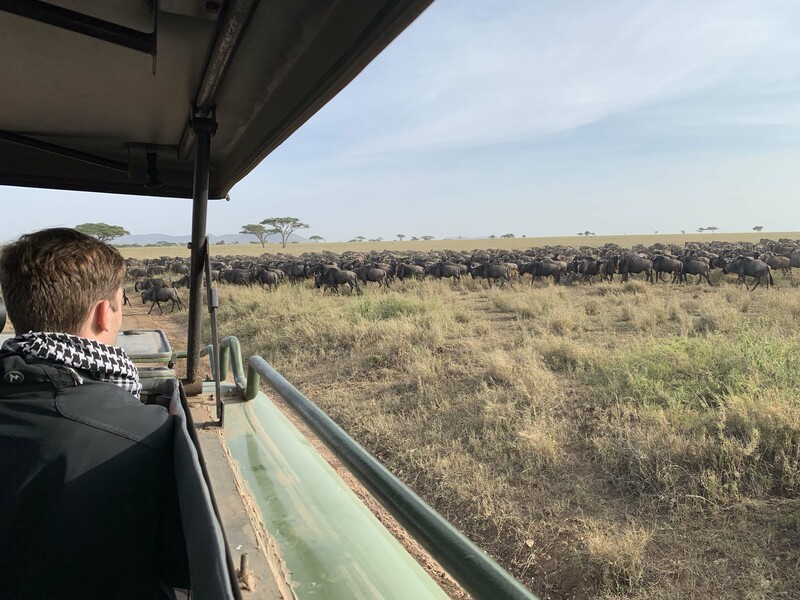 The vastness of the Serengeti is something that you can only experience and is impossible to fully describe, though I am sure there are great writers who have done so successfully. I’ve mentioned before of Hemingway’s The Green Hills of Africa, which doesn’t take place in the Serengeti, but rather Lake Manyara, and is a non-fictional account of a hunting trip that he and his wife had taken back in the days of wild Africa, when rhinos filled the park in what seemed like an over-abundance, though, unfortunately, we have learned all too late that that wasn’t the case such that the black rhino were hunted to the brink of extinction of Tanzania and elsewhere. 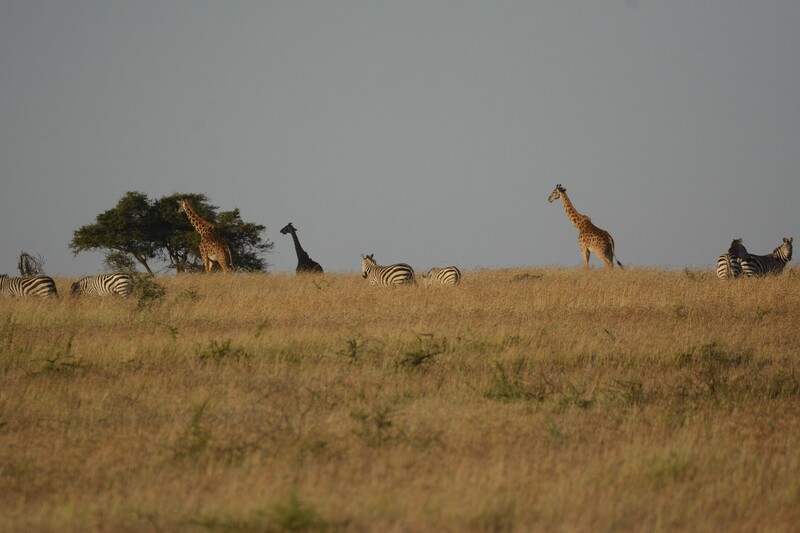 The Serengeti’s vastness isn’t really about standing on a tall mountain and seeing endless plains that reach to the horizon. It is about being there, with your heads often barely above the tall grasses, and looking out to see plains that stretch to what you see as the horizon is, only to reach that horizon and have the same scene repeat itself, over and over and over again, in a never-ending fashion that suddenly makes you aware of not necessarily your insignificance, but more so the importance of the universe of which you make up only a very small fraction of its entirety. It is humbling to say the least. 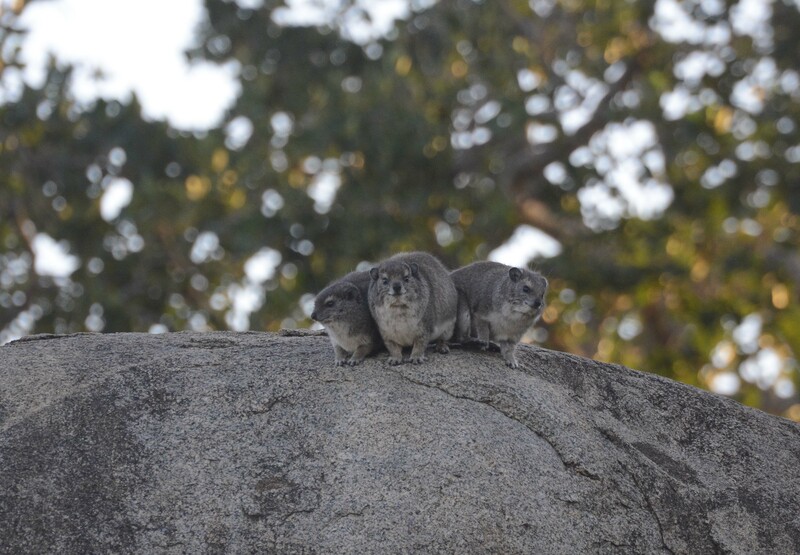 We explored the Kopjes during the morning, catching glimpse of occasional male lions doing what they do best, sleeping, as well as rock hyraxes, supposedly the closest living relative to the elephant, though recently debated. In between the Kopjes we saw every version of antelope, including the massive herds of wildebeest with their partners in the long migration, the zebra. The wildebeest and the zebra work well together in that they eat different lengths of grass and protect each other, the zebra acting as sentinels with their keen eye sight, watching for predators and warning the vastly larger number of “beesties.” The other antelope, which include the topi, eland, Grant’s gazelle, Thompson gazelle, and Cook’s hartebeest, occupy the grasslands along with the zebra and wildebeest while the woodlands are occupied by the impala and the dik dik. 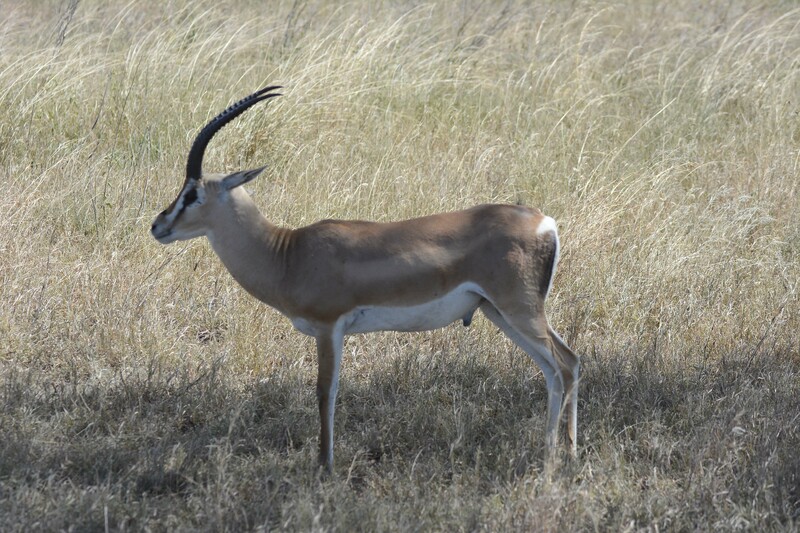 It is a cacophony of antelope here where they all live harmony together and in constant fear of the predators. 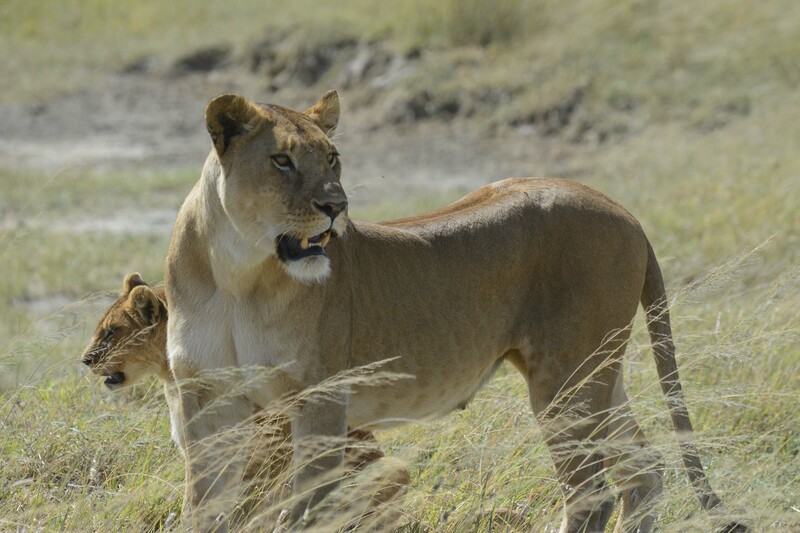 Large lion prides roam throughout, often hunting in small groups while the leopard is a solitary killer. 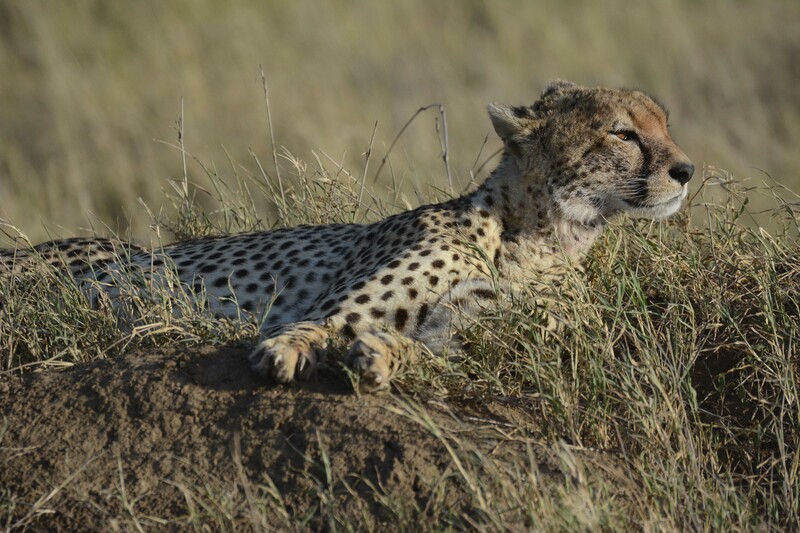 Cheetah are most often solo hunters, though you will often see two or three siblings or a mother and her older cubs hunting together. 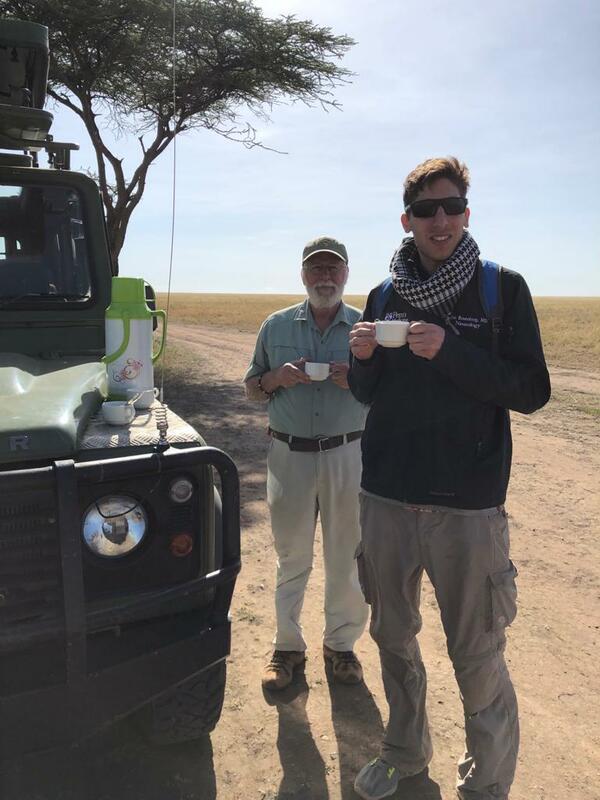 We stopped for a lovely breakfast under some trees where we were able to get out of the Land Rover and had chapati, hard boiled eggs, sausages, bacon, coffee, tea and juice, just to name a few of the things that were prepared for us. The bacon was the real hit of the day for everyone, I think, and it became known for the rest of the trip as “pumba bacon,” in honor of the warthog that is certainly related to the pig and is often hunted by the lion for this very reason I am sure. Later in the day, we also stopped for lunch that was a mixture of more delicious items that the kitchen had put together for us. 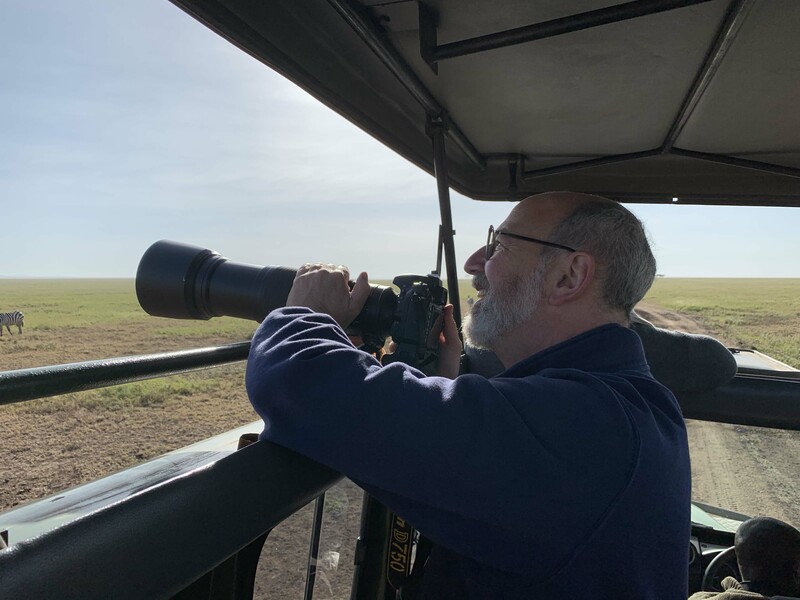 Everyone had a wonderful day of game viewing, but probably most of all, Dan, who is a passionate birder which is a breed all its own. I will have to admit, that when I was living in the suburbs, one of my greatest passions was my bird feeders and bird houses that I had located through our back yard that was heavily wooded. Having probably spent years selecting just the perfect locations for the feeders to completely foil the significant squirrel population that made their homes in our trees. I had cables strung between the trees from which the feeders hung with discs over eat feeder that protected them from the squirrels who would artfully perform their high wire acts with the thought of stealing some of birds precious seeds. I had also built my own version of woodpecker feeders from PVC tubes and galvanized wire strong enough to deter the squirrels who can eat through just about anything including wire that isn’t up to snuff. After twenty-five years living in the house, I had finally perfected squirrel-proof placement for the feeders, only to have moved on to downtown Philly where I now have no feeders. I do miss the birds and my feeders and nesting boxes, but I will have to admit that I also enjoyed the sport of out foxing the squirrels which probably doesn’t speak very highly of my goal in life in that regard if being smarter than a rodent becomes a pleasure in life. What can I say. Dan’s interest in birds was far more academic than mine and it didn’t involve outsmarting rodents. 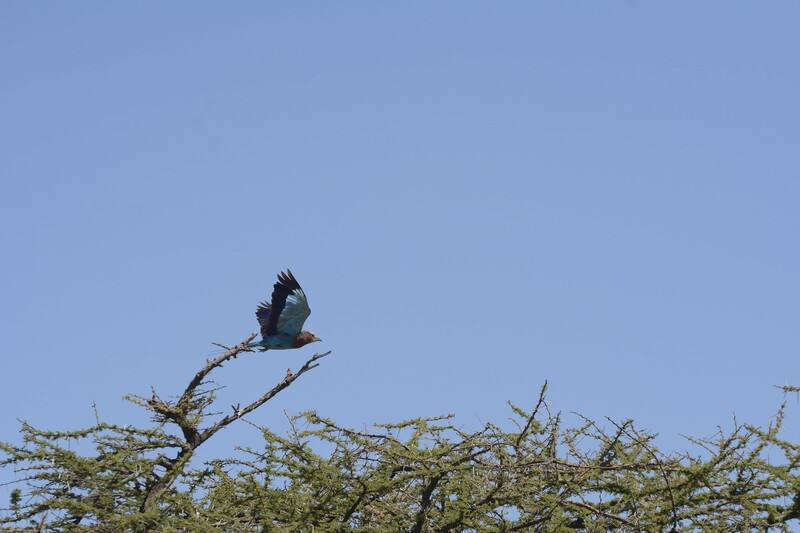 He had an incredible knowledge of the birds here even though this was his first time to East Africa, having previously visited southern African on safari. 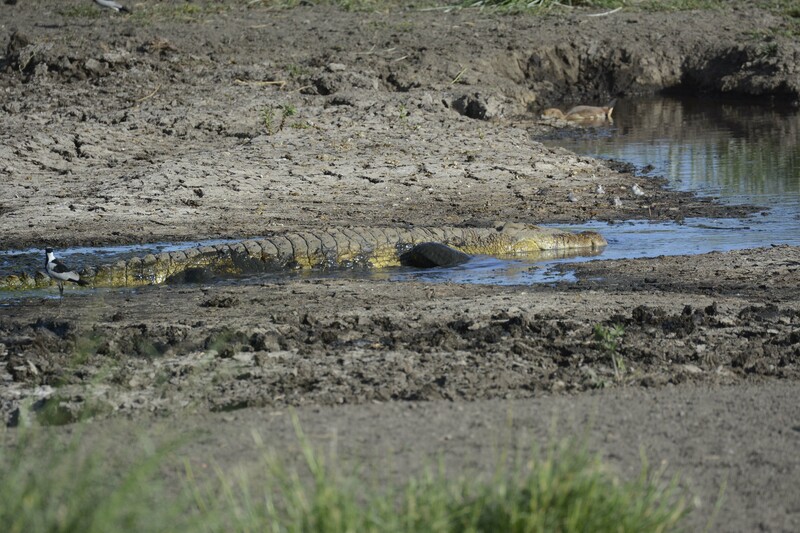 For one with this interest, there is so much more to our game drives as the number of birds species far outnumber the species of mammals that we will see in any given days. 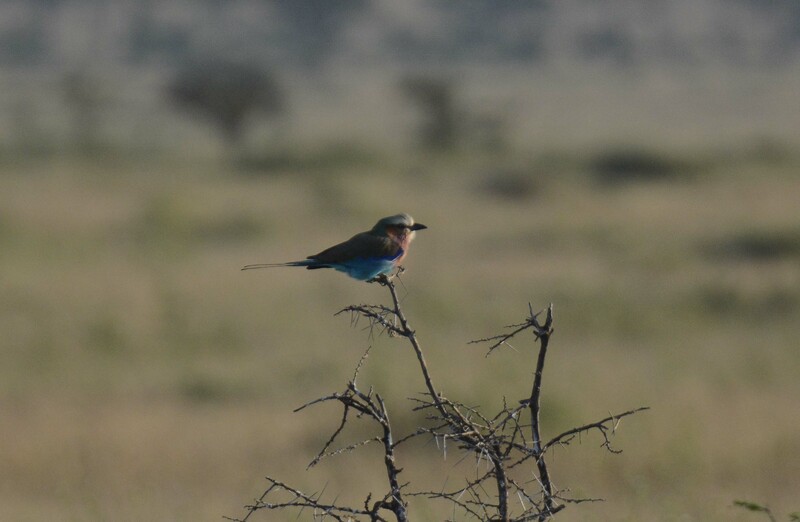 Birding here is actually quite spectacular and the bible, Birds of East Africa, has so much information on so many species that it dwarfs anything related to the mammals. 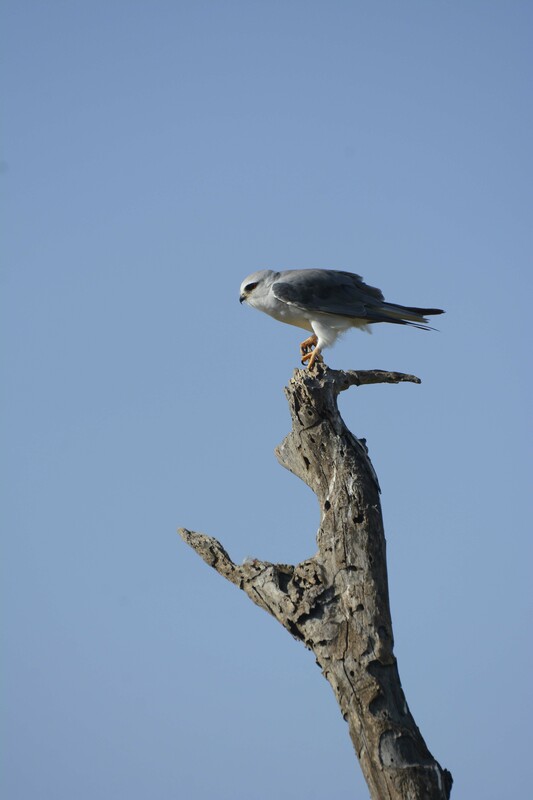 Spending the time with Dan, I found myself becoming so much more acutely aware of the birds despite having seen them numerous times before on the dozens and dozens of game drives that I’ve not only been on, but have also guided myself. 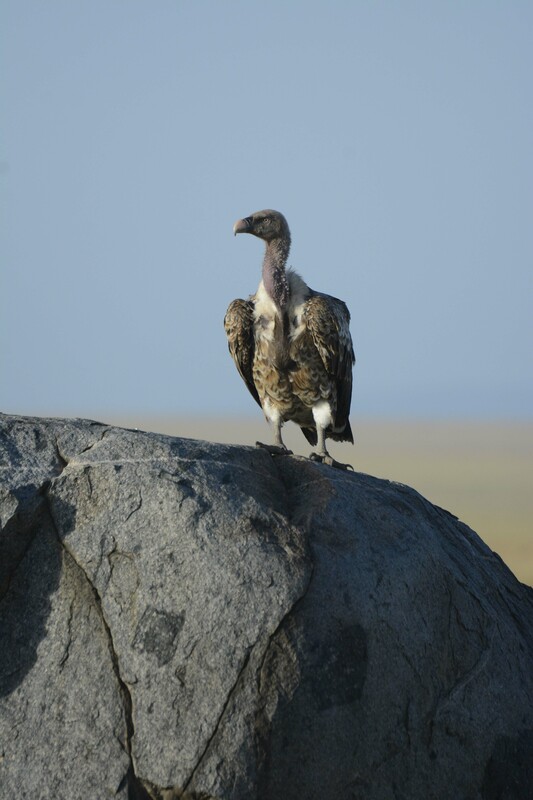 Because of his acute interest in the birds, I had actually requested a particular guide and friend of mine, Vitalis, who drove me to the Serengeti last year and had impressed me incredibly with his knowledge of the feathered component of our game drives. At the end of our safari last year, we had given Vitalis my Nikon binoculars as a present and in appreciation of his keen guiding skills. Any guide with his knowledge and skill deserves a pair of wonderful birding binoculars. 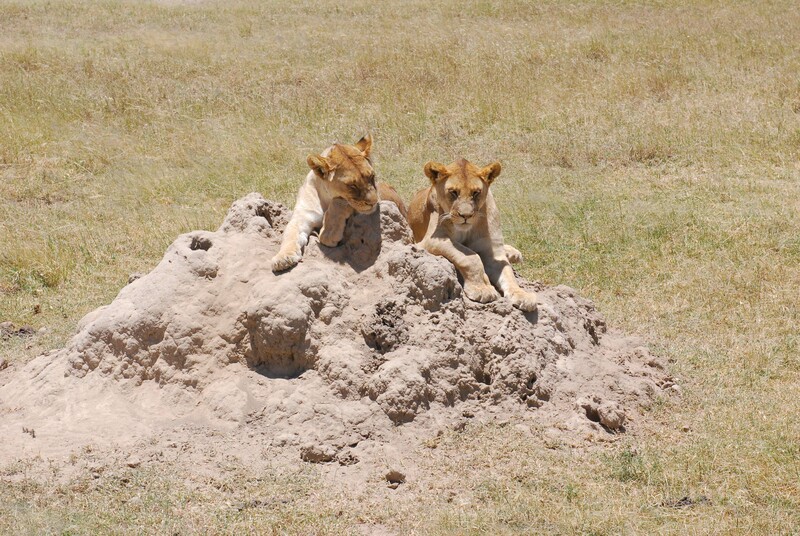 Some of the sights that we saw on this day included a lone cheetah on top of a termite mound who was nonplused with our presence, but didn’t seem to be on the hunting mood at the moment. 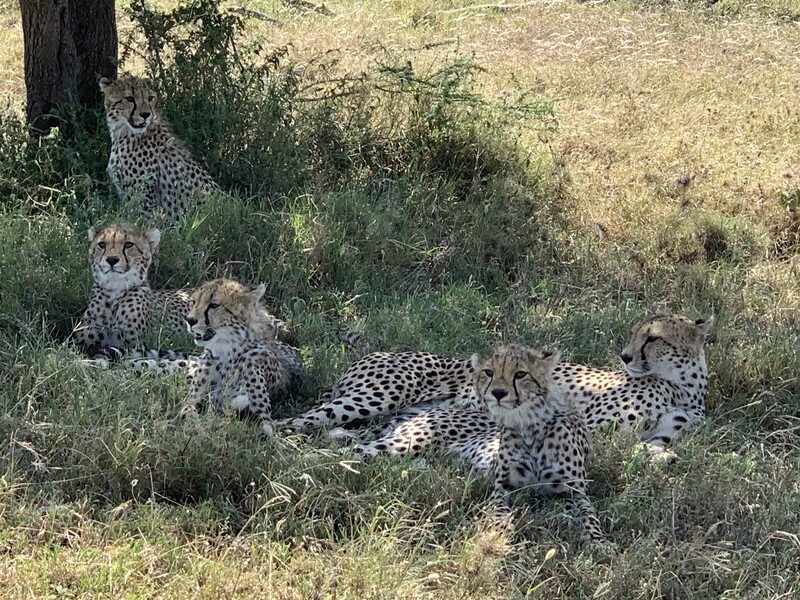 Later in the day we had seen the amazing sight of a mother cheetah and her four adolescent cubs who were almost the same size as she was, all resting under a tree, but clearly checking out the terrain. 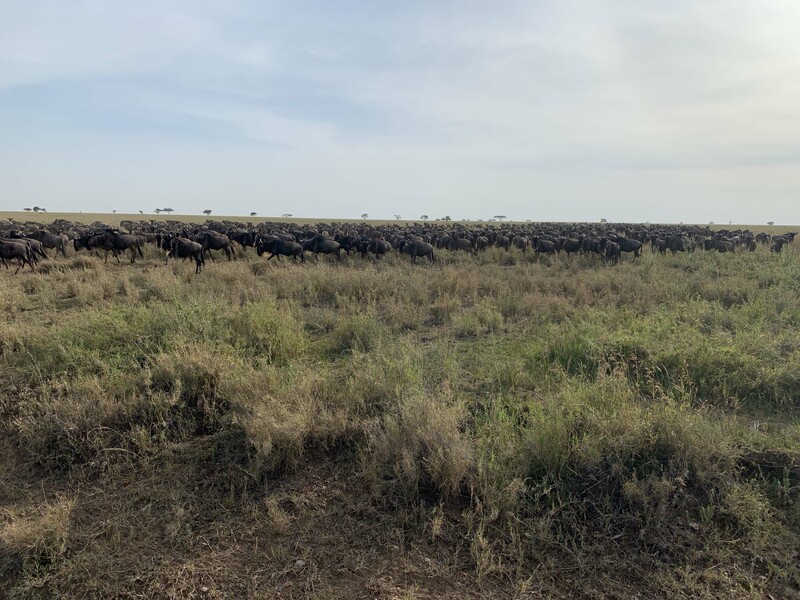 It would have been amazing to see this group hunt as they most likely would have been able to tackle even a wildebeest adult, but it was in the midday heat and they didn’t look necessarily enthusiastic about using the energy. 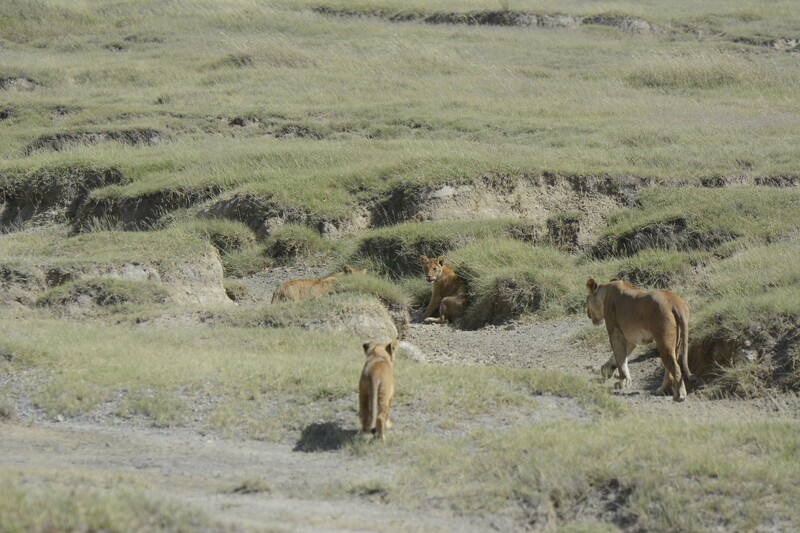 One of the funnier moments was when we were looking at a few lions sleeping and were parked alongside another vehicle. It contained an American couple and when we said hello and asked what they had seen, the woman promptly told us that they had seen a group of leopards a bit further back. 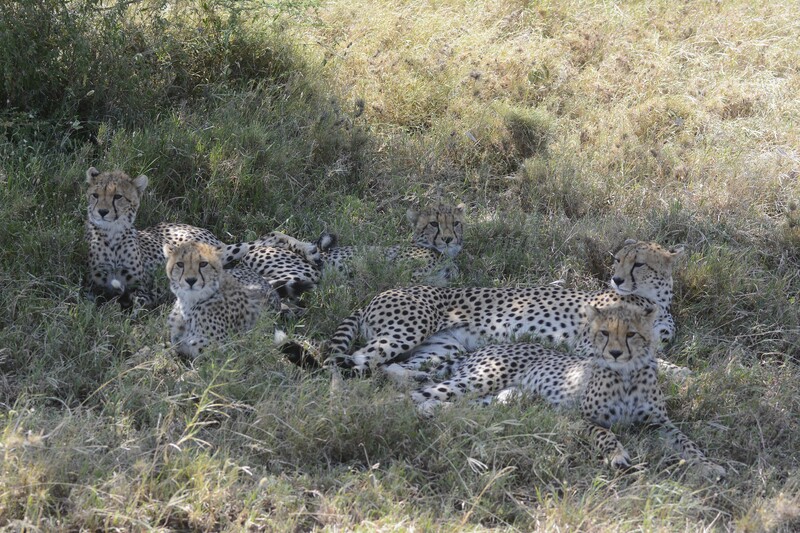 What she was referring to was undoubtedly the group of cheetah we had seen and her husband promptly corrected her. 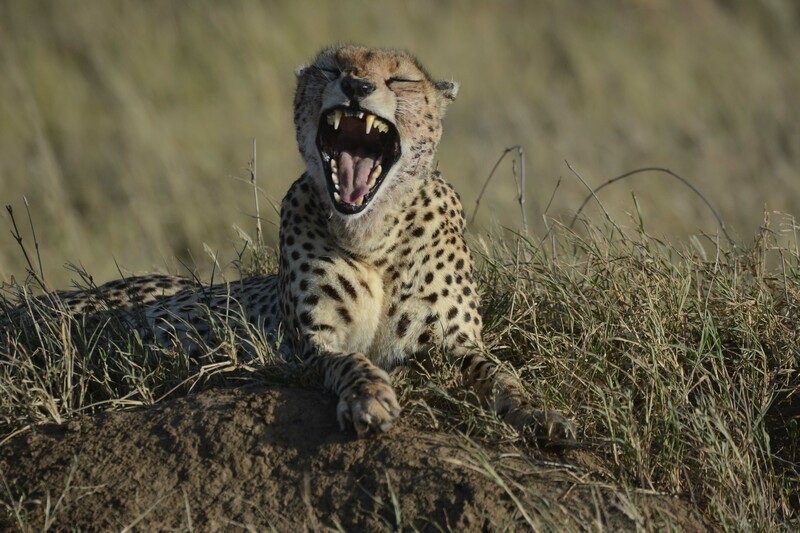 The mere thought of a group of leopards, which are solitary animals other than a mother and her little cubs was a bit ridiculous on its own. 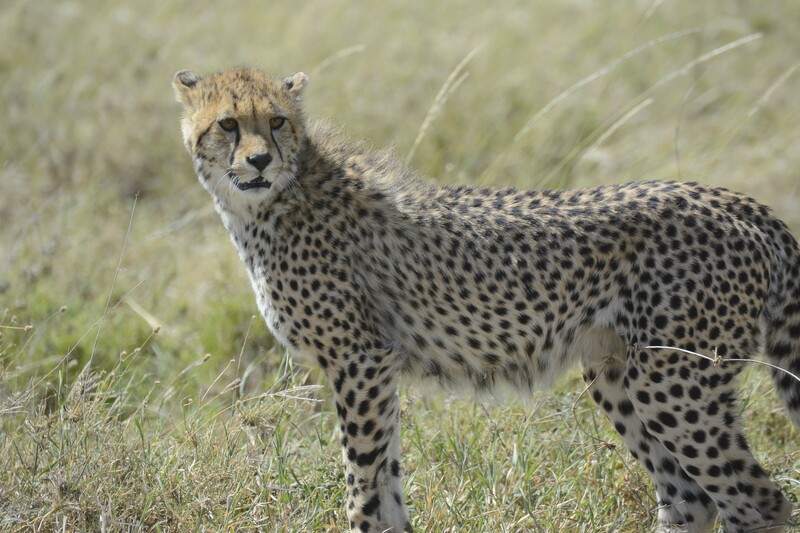 Shortly after, we pulled up to a massive line of vehicles jockeying for position to see what was reported to be a leopard in the grass under a tree that no one could see or even confirm. We waited a few minutes and then decided that it was quite unlikely that the leopard would surface, but before we left, the woman we bumped into earlier pulled up alongside us and after we pulled away we all had a good laugh regarding what she must have said about shy leopard in the grass. 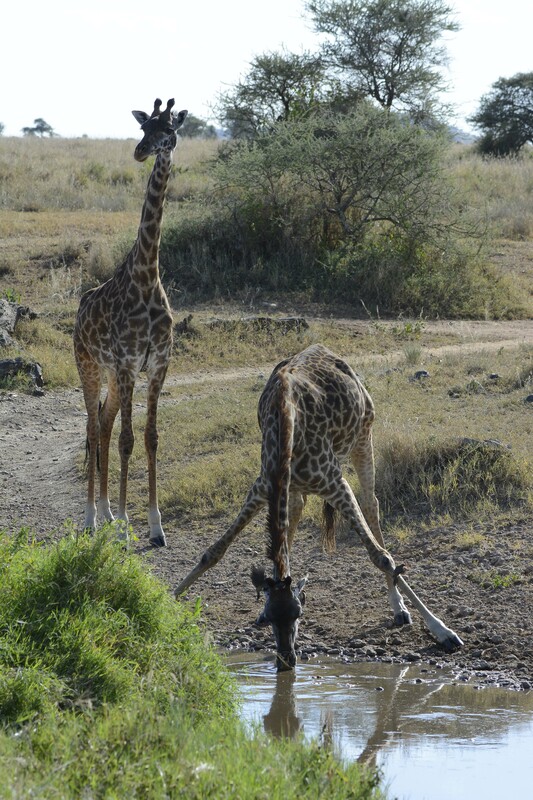 On the way back to camp that evening, we needed to find fuel to get us back Karatu as we had driven two full days on the current tank. 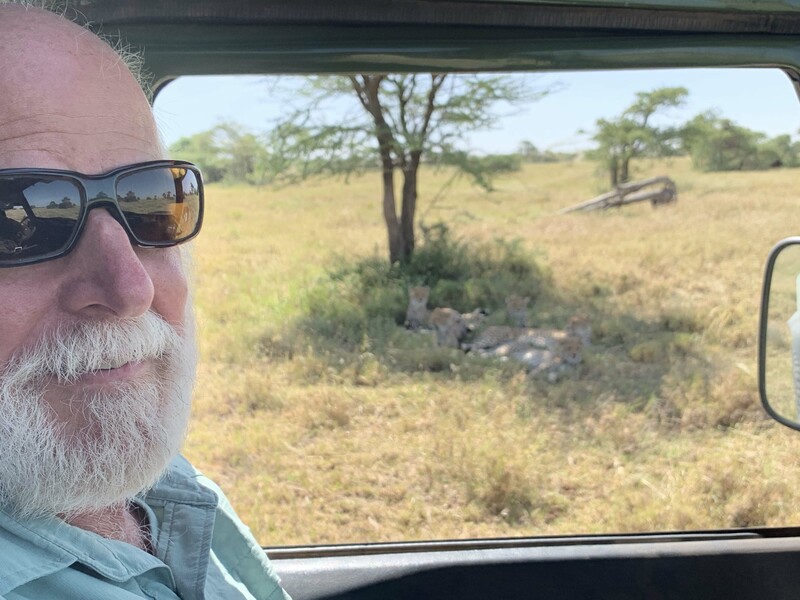 Turtle has a 70 liter tank and her powerplant is a four-cylinder turbodiesel that is very fuel efficient and great for these excursions to the Serengeti and beyond. The station in the village of Seronera where most of the visitor information is for the Central Serengeti was closed or didn’t have fuel when we arrived, so we drove up to another station (there are only two here) that was thankfully open and had fuel and we were now in good shape for the trek home tomorrow. We made our way back to camp before sunset and all took showers as were dusty and grimy from our day on the trail. Jones was going to stop by before dinner to say hello so it was good that we had time to freshen up. 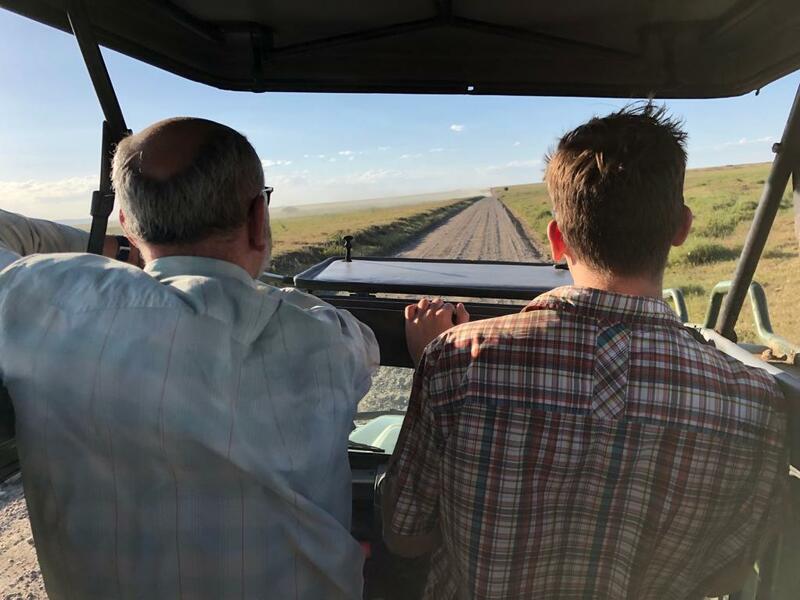 In the end, he brought a group of young people with him, all of him were friends working at the Seronera Wildlife Lodge and who he had arranged to have dinner at the camp. We sat inside the lounge tent and caught up on things. I have been inexorably linked to the entire Temba family since I first came to Tanzania with my children in 2009, and I will continue to be throughout my life as I plan to continue coming as long as I am physically capable of doing so. 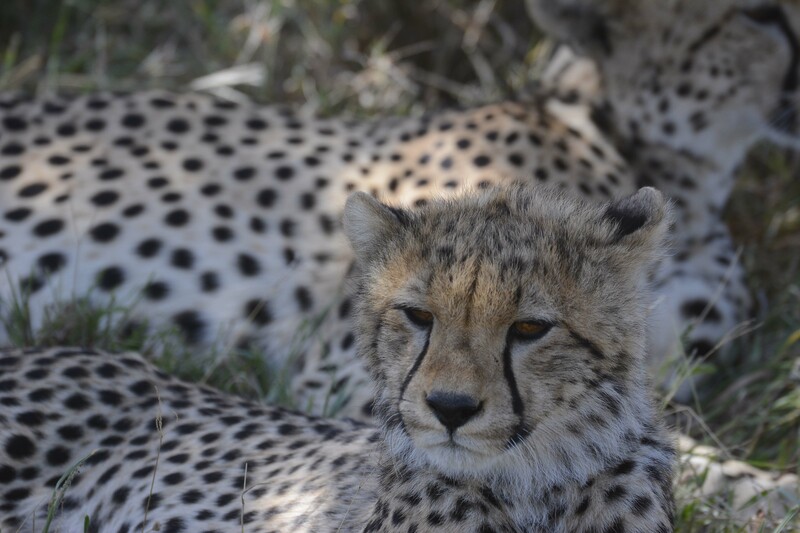 We enjoyed another relaxing dinner in the mess tent with all the wildlife abounding just outside our camp and ready for the sounds of the hyenas once again as we sleep. Walking back to the tents, as I shine my flashlight away from camp, you can see the many eyes of the animals that tend to surround camp as they feel safer around us for some reason. We were told that a small herd of Cape buffalo had been coming every night for the protection and I surely didn’t look forward to running into one of them walking back to my tent. We had planned to have breakfast at camp tomorrow, but would bring lunchboxes with us since we would be heading home and wouldn’t be coming back to camp.